Our favorite color appeared a few years earlier than was once thought. Above: A 1910 UT pennant in bright orange and white. When did the Longhorn football team first don that distinctive, burnt orange color? The bright orange and white had issues, though. The white stained easily on the athletic field, and the orange began to fade to a yellowish hue after being washed too many times. By the 1920s, opponents near the end of a football season would sometimes call the Texas squad the “yellow bellies,” which didn’t sit well with coaches or athletes. “When crowds watch the Longhorns fight their way through one of the stiffest schedules of their career, the men will wear uniforms of a color slightly different from the proverbial orange and white, according to S. N. Eckdahl of the University athletic staff, who has been issuing equipment to the Longhorn players. The history will need to be corrected. It was Coach E. J. “Doc” Stewart (photo at right) who introduced the burnt orange color 90 years ago this month. The change seemed to have been made within the Athletic Department; the Board of Regents didn’t recognize the new hue until much later. Burnt orange – or “Texas orange” – was used from 1925 until the Second World War, when the dye was no longer available. Team uniforms reverted back to their original bright orange color for almost two decades, until Coach Darrell Royal returned to the Texas orange in the early 1960s. 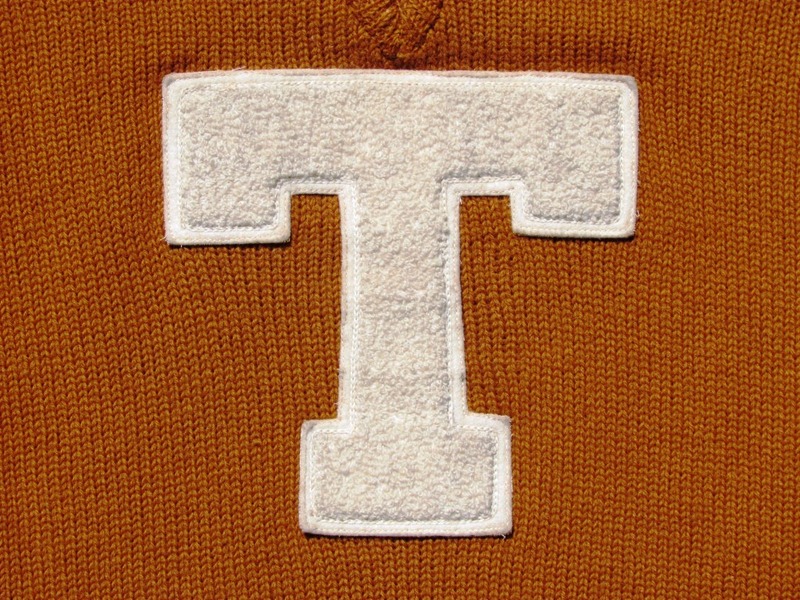 Above: A 1928 University of Texas football letter sweater. It was long believed that 1928 was the year a dark orange color made its first appearance, but a recent discovery has pushed the date back to 1925. 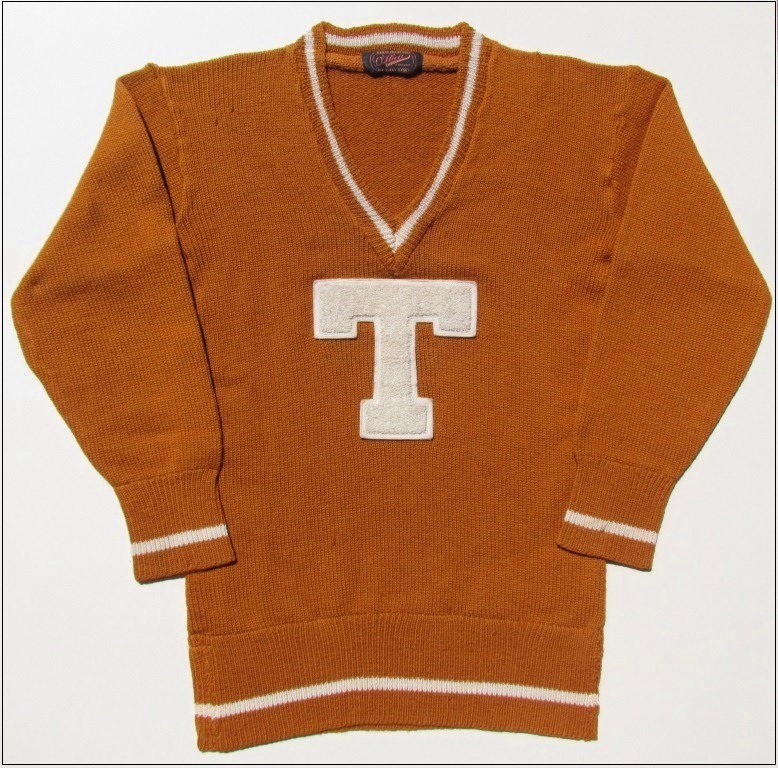 The sweater is still likely the first version of a “Texas Orange,” and is almost a rust color. 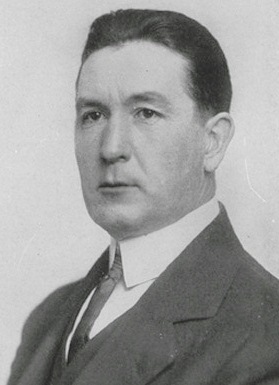 Both the sweater and the 1910 UT pennant are in possession of the author. This entry was posted in Uncategorized and tagged colors, Doc Stewart, football, Jim Nicar, orange, white by jimnicar. Bookmark the permalink. You earn two stars for this: one for setting the record straight, the other for enduring microfilm to do it! Thanks, David! You never know what you’ll find in the back pages of the newspaper. And I still thought Darrell invented burnt orange – I wasn’t paying attention at all. Thanks, Coach! It was an accident; I was researching something else and just happened upon it. Sometimes those are the best discoveries.